This page will be updated whenever I discover a new concept artist who takes my interest with their work. I will be explaining why I like their work and a link will also be given to illustrate some of the pieces they have done, along-side one example of their work directly posted here (below the mentioned artist). He has worked on films including Guardians of the Galaxy, Iron Man 3, X-Men: The Last Stand and Watchmen. I discovered his work on the ConceptArtWorld website, being one of the first concept artists I have looked at, I am surprised at how interesting and likeable his work is to myself. He seems to usually aim towards the futuristic or post-apocalyptic style of work, fortunately I appreciate both of these styles so I was taken from the get-go. His drawing lines seem quite abstract, which gives it quite a wondrous feel for the eyes, he also shows how he can entail a great amount of detail in his work, while maintaining a simplistic appearance. On ConceptArtWorld, Pron also shows how he can create ultimately simple designs, but still have a strong impression for the viewer. In this piece, the artist would’ve most likely been involved in the environmental team, and would’ve possibly had the specialized role of either pre-production conceptual art, or production convey art. It is safe to say that this artist is one of the most formidable at the time of writing this. He has recently worked on the best-selling game Destiny, he has also worked on Tron: Uprising, and a couple of Command and Conquer titles. I took a liking to his artwork, because although he can sketch futuristic pieces, he can also incorporate natural designs into these. I am interested by organic life in games just as much as the ‘man-made’ aspects. The fact that he brings both of them together so well just grabs my attention and keeps it. 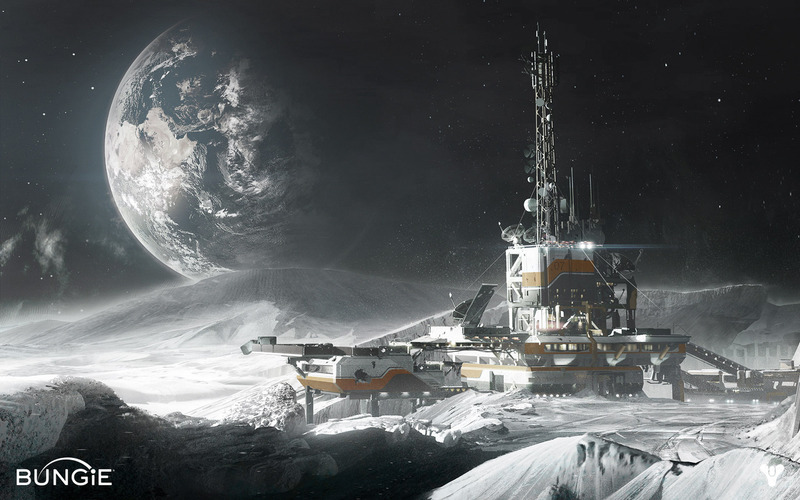 There is a lot of depth to his work too, as sometimes he uses astronomical scenes to portray scenes such as the moon environment on Destiny (shown below). He uses a very suggestive style, with a lot of incomplete lines to give the impression to the viewer that it shows detail, without actually giving any. This works very well in his futuristic designs as it means he can involve a lot of detail in small spaces, and give them a very clean look. Bacon would’ve been a part of the environmental design team and possibly as a pre-production artist, he may have also helped with conveying the game idea to the investors.